The event was dedicated to the anniversary of diplomatic relations establishment between Japan and Ukraine and also in the course of Year of Japan in Ukraine. 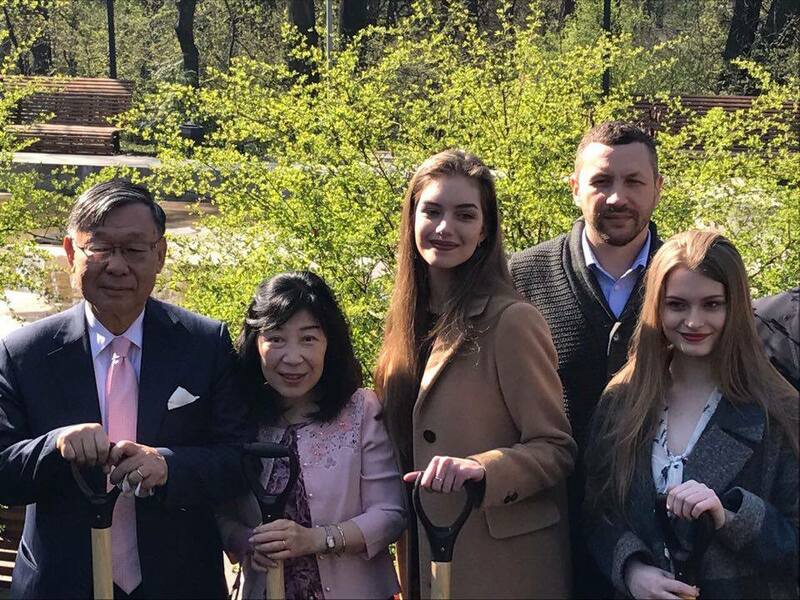 As sakura is the symbol of Japan, the Embassy started campaign with the planting of trees along all the territory of Ukraine so as to give possibility to all the Ukrainians to savor its beauty. ‘This year Ukraine and Japan celebrate 25-th anniversary of diplomatic relations, as well, it is truly significant year of Japan to Ukraine. Thus, our campaign on planting 2500 sakuras also comes in the frames of Year of Japan in Ukraine. Among this number of sakuras, 1000 trees are given by the embassy along with our partners, company JTI while behind it there is our wishes addressed to Ukrainians to plant as many sakuras as possible throughout the country. We have got a lot of requests from different cities that they would like to grow our symbol in their places. 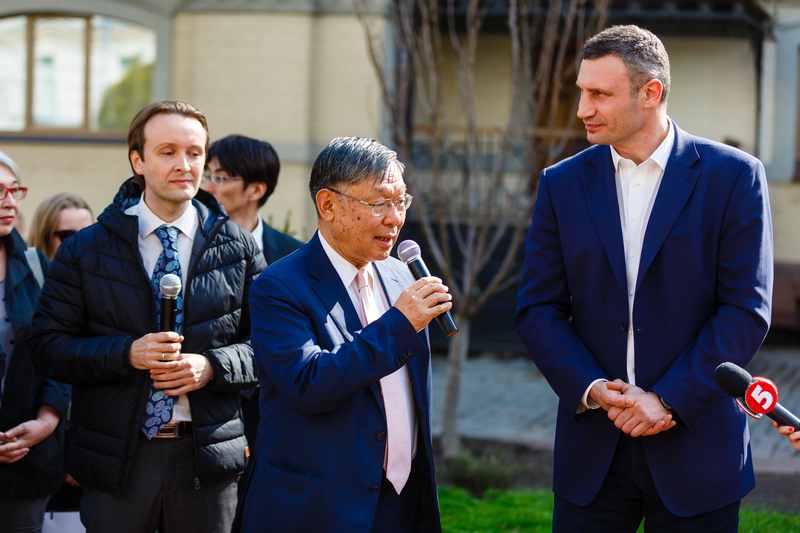 Having represented the embassy of Japan, we are ready to help as much as we can, and I hope that this year, including autumn, we will plant 2500 trees’, in the official greeting speech the Ambassador of Japan to Ukraine Shigeki Sumi told. The Rector of Kyiv National University named after Taras Shevchenko Leonid Guberskyy joined public with the greeting speech: ‘Today we are at very symbolical action as now we celebrate the 25-th anniversary of our country’s independence, and Japan was one of the first states that approved this independence. It is highly symbolical that auction happens exactly in the botanic garden of our university that had very tight relations and collaborated with the whole range of Japanese educational establishments. I think that planting of sakura, particularly, the tree that symbolizes verily Japan as the country will become one more sign of friendship, mutual understanding and collaboration between our nations. We are proud of that and respect our friendly relations supporting them. I consider that what we have done today and along all the years, will become the great step to even bigger understanding. We make a big deal’. Starting the event near National Opera of Ukraine, it was remarked that only in the capital this year nearly 100 trees will be planted. At Volodymyr slope, Golden Gates, in Mariin Park, Park Natalka, Park Kioto, at Landscape alley, near Kyiv choreographic educational establishment, within the territory of Kyiv National University named after Taras Shevchenko, Kyiv Politechnic Institute, in botanic garden named after Fomin and near National Opera House. All the trees will be planted in April and November this year. ‘It is very pleasant for me that in such a way we will celebrate the Year of Japan in Ukraine. One more pleasant news are that this year in Kioto Park we will create a garden of stones, as well, in June it is planned to arrange the visit of mayor of Kioto city. Thus, we continue to celebrate Year of Japan in Ukraine’, told in the official speech Ambassador of Japan to Ukraine Shigeki Sumi. ‘This year is the year of Japan in Ukraine, after many years of collaboration between our countries, between our twin cities, Kyiv and Kioto. It is very good that this year mayor of Kioto is coming to Kyiv as we have already started the preparations; plan a great deal of events, one of which is to become the opening of renewed Park Kioto. Sakura is the symbol of Japan, and I am very glad to join the planting of these beautiful trees in our city. 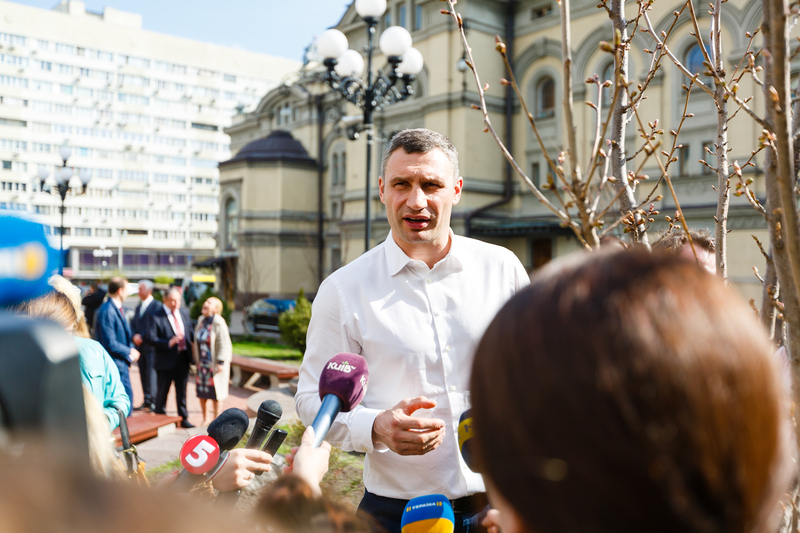 We have to do everything to make our city green, comfortable and cozy, so, it is impossible without these green plantings’, remarked Kyiv city head Vitaliy Klichko. Beginning from April, sakuras will have appeared in almost 20 cities of Ukraine, including Kyiv, Lviv, Odessa, etc. The planting of trees will occur in collaboration with the company JTI Ukraine and local authorities with the participation of Ambassador of Japan to Ukraine Shigeki Sumi and city heads.